Arthroscopy of the shoulder has become increasingly popular as a standard diagnostic and therapeutic surgical technique among orthopedic surgeons worldwide. 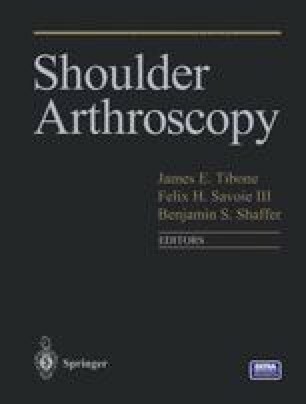 Evolving technology has furthered our understanding of the shoulder and its associated pathology; as a result, progressive advances and improvements in both surgical equipment and technique continue to be realized. Current arthroscopic treatment of common shoulder problems such as instability and rotator cuff tears has led to outcomes that are comparable to those achieved with standard open procedures, yet with less morbidity. Arthroscopy also allows visualization and treatment of certain intra-articular pathology e.g., SLAP lesions) that are not easily accessible by open means. The single limitation associated with arthroscopic shoulder surgery is the learning curve. Some procedures are technically demanding and may prove challenging to anyone without considerable experience. This chapter presents a basic overview of our simple and reproducible surgical technique for diagnostic shoulder arthroscopy. We outline the operating room setup and patient positioning for arthroscopy in the lateral decubitus position, and also describe the conventional portals utilized in routine diagnostic shoulder arthroscopy.